This resource is intended to provide valuable information for transportation professionals, river managers and others regarding transportation and infrastructure projects and how Section 7 of the Wild and Scenic Rivers Act (Act) applies. Early communication and coordination between project proponents and the river-administering agency will minimize the likelihood of project redesign, adverse Section 7 determinations, and permitting delays or denials. This Frequently Asked Questions (FAQs) is intended to be a living document that provides clear and accurate answers to common questions—or misconceptions—about the Act and its effects on transportation or infrastructure projects. The FAQs will be amended as new questions arise or further clarification is needed. For a specific question to which an answer is not provided, contact the local river manager or appropriate river-administering agency. PDF - Opens in a new window. 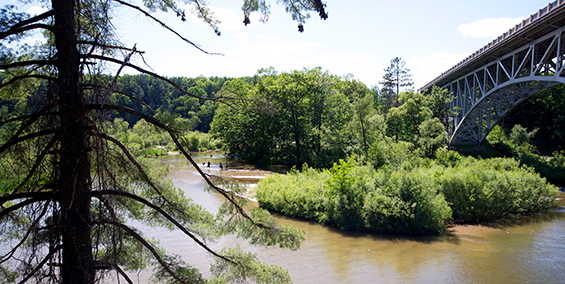 In response to requests from river program managers and project proponents, Council members have selected examples of Section 7 determinations for common types of water resources projects. Each is an actual determination made by river-administering agency staff from across the country. In some cases, clarifying user notes are included in individual determinations. No single example is best; however, in reviewing the range of examples provided, the practitioner will gain an understanding of how to apply the procedures outlined in the technical report. We are bringing these online one at a time. Please check back to see new ones. The National Park Service has compiled and maintains the NRI, a register of river segments that qualify or potentially qualify as national wild, scenic or recreational river areas. The Federal Highway Administration (FHWA) Environmental Review Toolkit is a one-stop resource for up to date information, guidance, best practices and training on transportation and environmental policy. The site provides information on environmental regulation and legislation, including the National Environmental Policy Act (NEPA), Section 4(f) of the Department of Transportation Act and the National Historic Preservation Act. The FHWA provides basic information on general environmental statutes affecting transportation and infrastructure projects. The FHWA provides an overview of the National Environmental Policy Act (NEPA) as applied to transportation and infrastructure projects. Section 4(f) established a national policy for protecting publicly owned public parks, recreation areas, wildlife/waterfowl refuges, and historic sights of local, state, or national significance, from conversion to transportation uses. The Red Book discusses the requirements for many regulations and functions as a “how to” for synchronizing NEPA and other regulatory reviews in relation to transportation and infrastructure projects. Section 404 of the Clean Water Act regulates the discharge of dredged or fill material into navigable waters, including wetlands and tributaries, of the United States. The USCG Bridge Program oversees the locations and plans of bridges and causeways constructed across navigable waters of the United States. The Civil Works division of the USACE includes water resource development projects including flood risk management, navigation,recreation, infrastructure and environmental stewardship, and emergency response. We've tracked down all of the state Department of Transportation web sites for you, as well as many pages that will help you in reviewing proposed transportation projects. Do us a favor in return: Because the web is constantly changing, let us know when you find a link that is no longer working. We'll fix it for the next person. Transportation and infrastructure projects should incorporate appropriate geotextiles and construction materials to protect river values and water quality. Biodegradable, durable, natural materials, such as coir, jute, sisal and hemp are generally more compatible with natural river processes and ecology, reduce air and water pollution and are more aesthetically pleasing than conventional materials. We are working on a list of alternative construction specifications that can make projects more compatible with the environment. Until then, research terms like 'natural fiber geotextiles,' 'coir fiber soil wraps,' 'engineered logjams,' 'brush mattress,' 'jute fabric,' or 'hemp matting' for more information.